Harriet Tyce’s Blood Orange could easily serve as “Exhibit A” disputing any claim that domestic suspense is less gritty, less dark, and less risky that its noir sibling. Crack the spine on this novel to enter a bleak landscape filled with deeply-rooted violence, poor decision-making, and levels of sexual danger that would make anyone consider celibacy. Blood Orange is the story of Alison Bailey: a UK-based lawyer married to Carl, mother to Matilda, and mistress of Patrick Saunders. It is clear from the beginning of the novel that Alison wants to break things off with Patrick, to be a better mother to her daughter, and mend the fissures within her marriage – but the difference between desire and doing can sometimes be a wide chasm. Unlike some novels featuring lawyers, Harriet Tyce refuses to sugarcoat the stresses of working on multiple litigations at once. Even after Alison is given her first murder case, the novel documents many of the other lesser court appearances this busy lawyer must juggle around the demands of this new high-profile assignment. As luck would have it – bad luck, that is – Alison’s mentor, assigned to help her prep for this murder trial is none other than Patrick Saunders, making any hope that she can resist his charms impossible. Alison’s struggles with alcohol certainly contribute to her questionable choices. It can be frustrating for the reader to watch as she continues to compromise the good things in her life; and yet, the reality is that people can always find ways to justify their decisions – even when those viewing from the outside know better. In the case of Blood Orange, fans of domestic suspense will have no troubles tracking what is happening to Alison. Except that, rather than diminishing the suspense, Harriet Tyce manages to use this to ratchet up the tension readers feel as each risk marches Alison closer toward total destruction. Harriet Tyce artfully navigates the blame game. Readers are only privy to Alison’s point-of-view, but within that are indications that no one in this book is making good decisions. The question is whose decisions are simply ill advised and whose are actionably criminal? 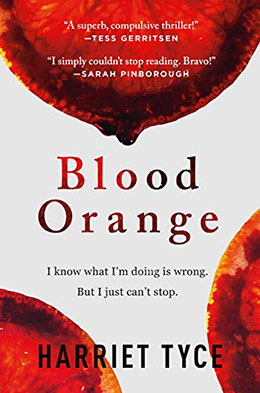 Make no mistake about it, Blood Orange is a feminist crime novel: The murder trial involves domestic violence, there is workplace sexual misconduct, controlling behavior complicates almost every relationship within the book, and patterns of abuse reign. Toxic masculinity is a huge societal issue and there is no shortage of crime novels intent on examining this ill from every possible angle. That said, Harriet Tyce’s debut is a brutally realistic and unflinching example of how destructive this mentality is and how difficult it can be to avoid becoming another casualty laid at its feet. Well-written, this dark book is at times harrowing to read because of how mundane it all feels. At the same time, that is precisely why Blood Orange ranks as such an important read. Oh, and let’s not forget – eating oranges will never be the same again! I couldn’t f\inish it. It’s very “alcoholic “. I can understand that. It’s really not a book for the masses. That said, I think the drinking comes from an authentic place. This sounds really good. Just ordered it!